The Maine House of Representatives, the lower house of the Maine Legislature, recently installed an FSR FLEX LT-150 control system to manage 158 microphones used during legislative sessions. According to Tom Loveitt, design, sales, and support at Canfield Systems, who designed and installed the FSR system, the FLEX LT-150 is installed at the desk of the assistant clerk in the House of Representatives chambers and is operated by the journal clerk during legislative sessions. The project involved replacing the existing, 18-year-old Danish Interpretive System (DIS) with a current model. As Loveitt explained, the older, analog DIS conferencing system had an optional, external control panel on which the operators had become dependent. However, that panel did not exist in the new, digital system. While the associated GUI software is powerful, Loveitt and his team had to replicate some of the older unit’s features on the FSR Flex panel. Flex-LT is a self-contained control system with a variety of features. 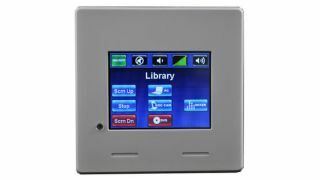 The Flex-LT mounts in a wall or sits on a desk and presents the user with an intuitive 3.5-inch color LCD touchscreen and an IP port. Through the touchscreen, the user can choose which source is being displayed and change the volume. The Flex-Able configuration utility is designed to help users get the most out of the system: The contractor is presented with an easy-to-follow, drag-and-drop programming methodology, with no need to learn another programming language.